The Tour de France is a spectacular event to watch. The annual jamboree for the Tour de France will be starting soon! Here is a video introduction to the route for 2017. If you want to catch the Tour de France highlights: The Tour de France is on ITV 4 and British Eurosport every day of the race. Situated in Nuits-Saint George this little gem belongs to the Cistercians of the Strict Observance. The abbeys construction began around 1140 and was completed in 1193. It was also a preferred place of burial for the Dukes of Burgundy. The gardens are rich with lush green grass, hedgerows and moss covered walls that give it a rustic look. You will also find about 35 monks here who produce a cheese with the abbeys branding, caramels and honey-based candies. Citeaux Abbey is definitely one stop that will captivate you from the moment you enter the grounds. Enjoy the historic site of the Abbey of Saint-Remi. It is found near the Basilica of Saint Remi which was constructed from the 11th Century. Together, they are a World Heritage Site. 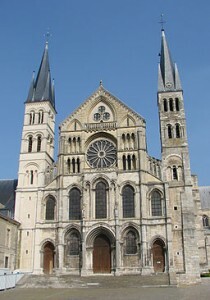 The Abbey of Saint-Remi is found in the Champaign capital of France, the city of Reims. The city itself is more than 2000 years old. Twenty-nine kings have been crowned in this city, specifically, inside the Notre-Dame de Reims Cathedral. It is surely a sight to behold. The most famous landmark in Chambery, this monument was built in 1838 in honour of Benoit de Boigne’s accomplishments while in India. The fountain has the front of four elephants on all four sides, that look remarkably real, the column that rises through the centre is in the shape of the savoyan (savoyarde) cross, finally at the top stands the statue of Boigne. In Dordogne looking over a sheer cliff face sits the Chateau de Beynac, a haunting and yet absolutely stunning castle which was constructed in the 12th century. Once inside you can see tapestries showing hunting and many other scenes of activities from the middle ages. The castle has also been the location for many films and TV series such as, Le Capitan, Ever After and Chocolat. Another castle of interest is the Chateau de Foix, this is mainly due to the rich history. The castle became the capital of Foix and was a key installation in military history. From inside the castle you can see the town span around the plateau and if you are on the hills looking onto it you can see the castle standing tall over the town of Foix. This used to serve as a coal carrying railway that transported anthracite until October 1988, since then the local tourist office chartered seasonal tourist trains. In 2010 a landslide destroyed parts of the tunnel and it is unclear when service will resume. It is still a wonderful site to see from the town of Grenoble and there is a lot of history to learn from the landmarks. This town has many sites for you as you make your way to the end of the route. Chateau de I’Emperi, a castle that still dominates the little town, was damaged by an earthquake in 1909, but has since then been restored. Fontaine Moussue, a stunning fountain in Place Crousillatis a beautiful sight by night. If you are lucky the market will be open, where you can buy mushrooms, sausages and paella. Marseille is a beautiful coastal city with spectacular views of the ocean. You can also find the Porte d’Aix triumphal arch which commemorates the French victories on the Spanish expedition. Most of the attractions however are shopping which are located in the 1st, 2nd, 6th and 7th arrondissements. This museum in Paris is a must if you enjoy French history, it is housed in the old Gare d’Orsay train station making it more intriguing. The museum holds mainly French art dating back to 1848 up to 1914, it includes paintings, sculptures, furniture and photography. It also houses the largest collections of impressionist as well as post-impressionist masterpieces by painters such as, Monet, Manet, Renoir, Degas, Cezanne, Sisley, Seurat, Gauguin and Van Gogh. Probably one of the most noticeable monuments in Paris, the Arc-de-Triomphe stands as an honour to the men and women who died in the French revolution and Napoleonic wars, inscribed on both the inner and outer surface are the victories and generals. Beneath it is the Tomb of The Unknown Soldier from World War 1.